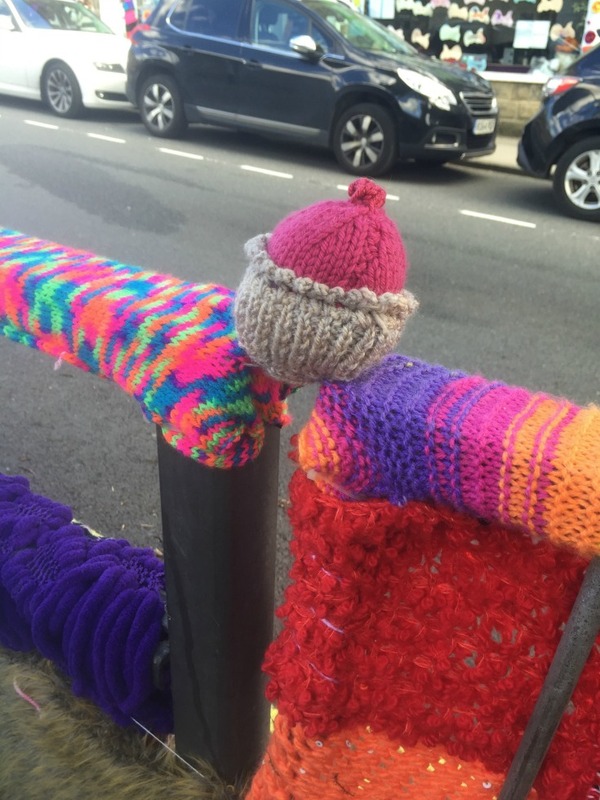 We had a lovely weekend – The sun was out for most of it which helps but we came across a great initiative in Leeds that made it even nicer. We travel 60+ miles to Leeds every weekend on both Saturday and Sunday. Most of the time, I take Millie to training on my own but every now and then we all squeeze in the car and spend the day in Leeds. We were invited to a blogging event at Smiggle in Manchester, early Sunday morning so it wasn’t worth heading back home before setting back out for Leeds. We dropped Millie at the pool, then pondered what to do for the nest 4 hours. We could have used the time wisely to start some holiday shopping or even get the school uniforms bought for next year, but it was far too sunny a day for the White Rose Centre. A quick call to my sister and we found ourselves driving to Horsforth in Leeds. About 20 minutes outside of the City Centre, Horsforth is really just 2 main streets with lots of little shops, most of them independent retailers. 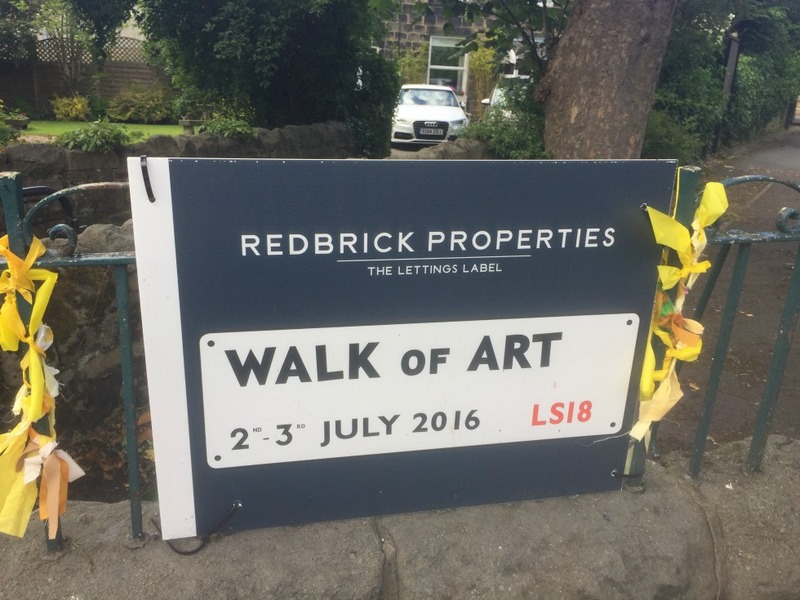 Horsforth had organised their first ever, Walk of Art. Dedicated to celebrating all things creative, near enough every single shop had some sort of art exhibition in their windows – There were paintings from local school children, glass ornaments from professional artists, jewellery from budding designers – even the local barber shop had some children’s pictures in their window. There was live street music, every public building you went in had some sort of craft activity for kids and grown ups too. You could make your own jewellery, decorate your own cupcakes, wash them down with homemade lemonade and then trundle onto the next activity. 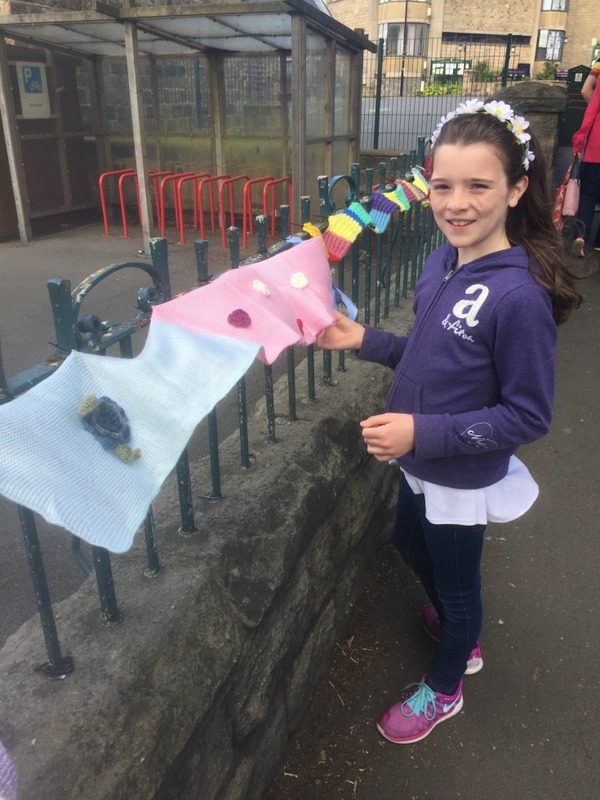 There were over a 100 registered activities taking place over the weekend! 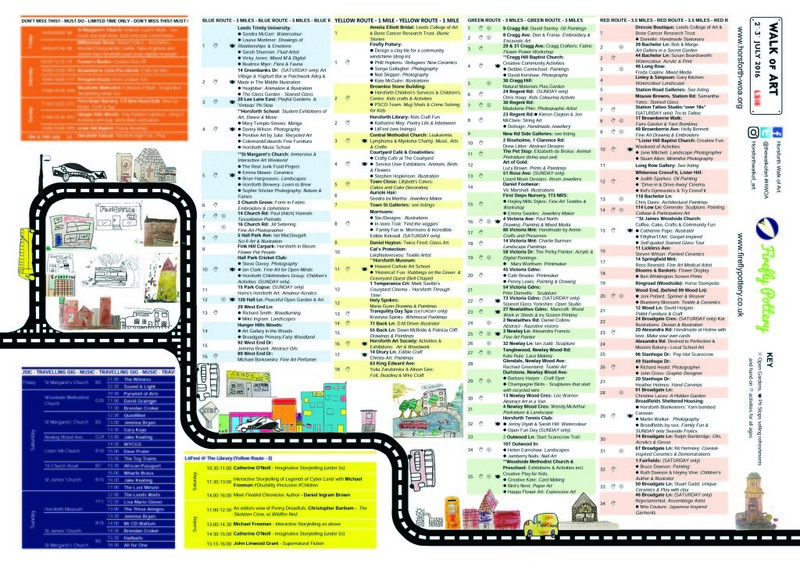 We could get a map from the local library and literally walk around the art – Several houses had opened up for people, there were scarecrows in gardens, cake decorators showing off their skills under gazebos, tea and coffee being supplied on every street corner. The Key to what was taking place can be seen below – Its immense! 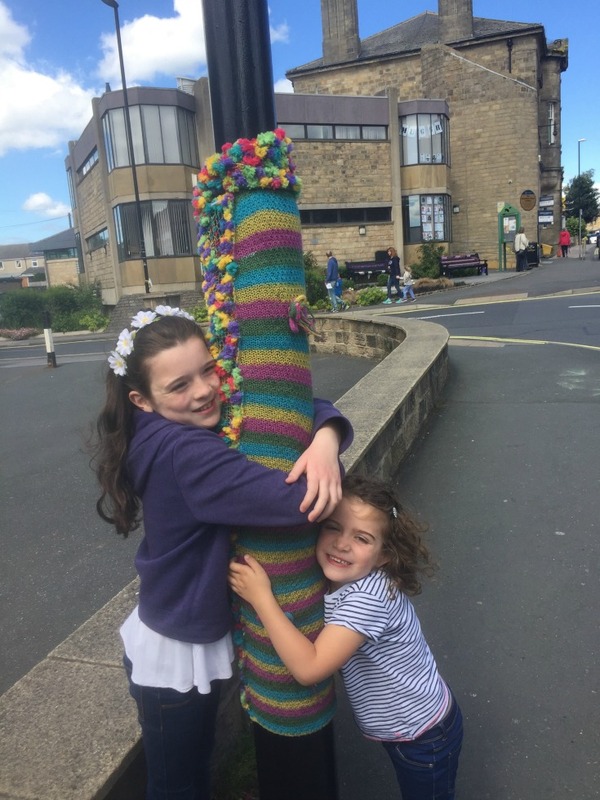 Even the village benches and lampposts had a makeover for the weekend with plenty of yarn bombing going on – As you can see, my girls were so inspired they felt they had to hug the lamppost! I just had to take some pictures. The main shop in the town centre is Morrisons and even they had a treasure hunt going on inside the shop – There were small groups of children going up and down the aisles searching for clues. It was such a lovely, well attended event – the shops were bustling and hopefully the tills were ringing. 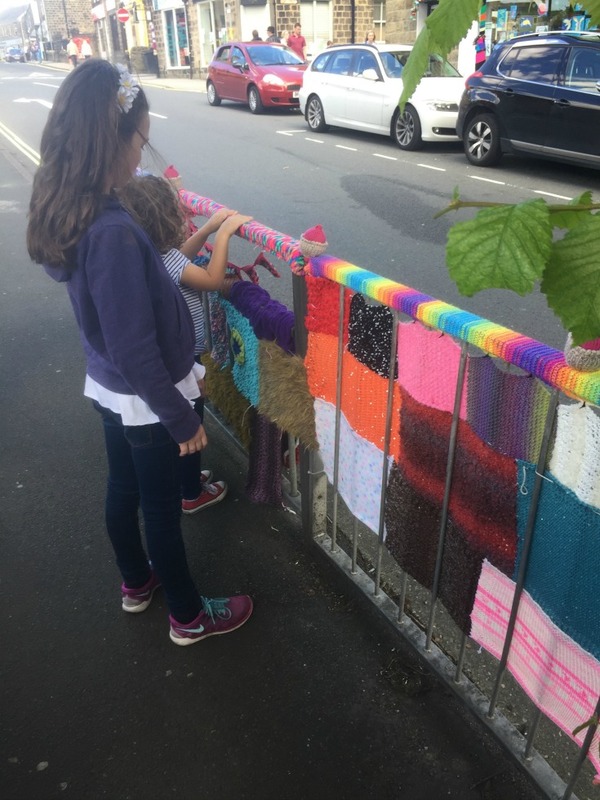 I’d love to see more villages doing this sort of thing – It was great to see people chatting and getting to know their neighbours. Hello! I am the organiser of the Walk of ART. Not sure if I messaged you originally but have just seen your lovely blog again. Thank you very much for talking about us and I am glad you had a lovely day. It’s our fallow year this year but we are back with a bag in 2018!